The Gran Vía of Madrid is definitely a must-see in the capital city of Spain. Until recently, Madrid was not a city of very high buildings or skyscrapers. Lately, this has been changing in the area of Paseo de la Castellana and Plaza de Castilla, but just recently, the highest buildings were on Gran Vía. And they have history. And a great beauty. Walking on Gran Vía means looking up and down constantly. Because of the buildings and because of the people, and because of everything all around you. One can say Gran Vía is to Madrid what The West End is to London. Full of cinemas, theaters, people. I think it’s no exaggeration to say that here are few streets in Madrid quite as captivating as Gran Vía. That’s precisely what makes it a must-see place for any visitor to Madrid (although we locals also like to enjoy it). It was built at the beginning of the 20th century during an ambitious project to connect Madrid’s two most prosperous districts, Arguelles and Salamanca. The solution was to demolish some of Madrid’s older and more run-down neighborhoods and build new, elegant buildings in their place. The effort wasn’t in vain. Some of the most beautiful buildings in Madrid are located on Gran Vía, like, my personal favorite, the Metrópolis Building. Does anyone look up when walking? I mean, when you get lost walking in a city, do you usually look up? Do you usually see the top of the buildings? If so, congratulations. You don't know what you're missing if you don't. It is the case of the Gran Vía of Madrid, the top of the buildings are incredibly beautiful. From the emblematic Capitol building (Schweppes), passing by the beautiful Telefonica building and the no less impressive Grassy building, etc.. You just have to be willing to see it and enjoy a simple walk. Gran Vía is a completely obligatory stop for anyone who visits Madrid. It’s my favorite street in the Spanish Capital. During the day, it’s filled with people shopping at the countless stores that fill the street, sitting at one of the terraces to have a drink or a bite to eat, or just going for a stroll. At night, everything is lit up. Each weekend Madrid’s Gran Vía is party central and packed with partygoers, whether it be the cold months of winter or the scorching months of summer. People are always out and enjoying themselves on this street. My favorite part of Gran Vía is where it begins, next to the Metrópolis building, one of the most emblematic and symbolic of the city. I don't know what to say about this avenue. To me it is the best street in the entire country. The activity almost 24 hours a day, the color and all you can find all the way long is without a doubt a good presentation. There is always something to see, someone to talk to or to spend the morning, the afternoon or the night with. Every time I go to Madrid, since the first time I visited in the mid-eighties, I go to Gran Vía. I feel like a fish in water, going up and down the avenue, from one side to the other... It makes me happy! It never sleeps. An avenue with frenetic activity. A street in constant movement. 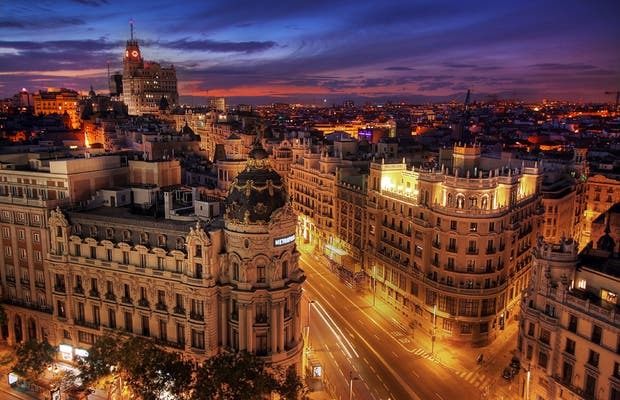 The Gran Vía of Madrid turned a century old, a historical and cultural reference offering a whole universe of opportunities: along the two kilometers you can have a coffee, eat in any restaurant, enjoy great shows and even get lost in the big stores. What can I say about this street of Madrid that has not been said yet, very little if anything. I love going on this street, even though I was born in Madrid and I have walked there an endless number of times, I don't get tired of walking with my camera and find out about new details on the buildings. The former cinemas are now used for musicals, the Telefonica building, the Carrión, the Callao cinema, the Metropolitan and so many more all the way down Gran Vía.